Hey Harvard! Please join fellow local alumni for Global Networking Night as alumni come together in cities around the world to explore and expand our Harvard Networks. These free events are designed to promote interesting conversations and professional network-building. We are planning for a diverse crowd by age and profession. 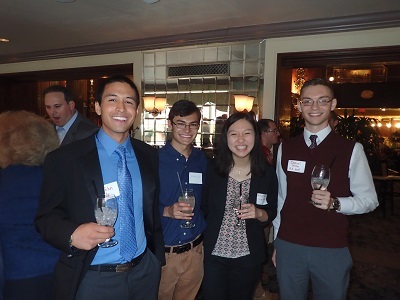 The past few Cincinnati-based GNN events have been big hits and this will be the first Harvard Club of Cincinnati event of 2019, so make a New Year's resolution to join, make some connections and have a good time! The venue is located across from hotel registration on the second floor of the Hilton Cincinnati Netherland Plaza (the lobby level). Upon entering the restaurant, simply look for our Harvard banner on the upper tier (up the ramp) or ask any of the staff and you will be directed to our event. Complimentary valet parking is available at the Hilton (accessible by Race Street) to those who register on the event website. Registration will open in early December, so stay tuned for emails from the Harvard Alumni Association and the Harvard Club of Cincinnati. Complimentary hors d'oeuvres will be provided by the Harvard Club of Cincinnati. Happy hour drink specials will be available to our guests until 7:00 p.m. Sponsored by the Harvard Club of Cincinnati in partnership with HAA. Contact Sid D'Souza with any questions.